Our two studio apartments are located behind Casa Pequena on Calle 6. 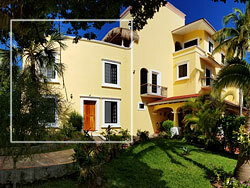 Casa Pequena is located about one and a half blocks from the ocean and about two blocks from the town square. Our studio apartments are located within easy walking distance to all of the downtown restaurants and shopping. See photos of our studio apartments. Adjoining our Casa Grande are two studio apartments with a double bed in each. The ground floor studio has its own entrance outside of Casa Grande and is rented separately. The upstairs studio is reached from inside Casa Grande. The upstairs studio is available to people who rent Casa Grande and need more room for extra people. Both studios are air-conditioned. There is a kitchen area with refrigerator, electric stove, a microwave oven, and a toaster oven. There is a complete set of cookware, plates, glassware, cups, and silverware. A purified drinking water dispenser is provided in the kitchen. The water in the faucets is fine for washing and bathing. There is a very large, lush tropical garden at the front door, perfect for afternoon margaritas. Click on the right side of each photo to advance.